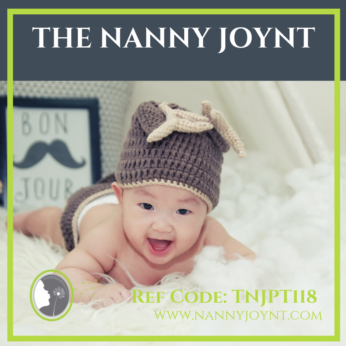 The Nanny Joynt is happy to share a wonderful part time nanny position available with one sweet 6 month old boy! The family is looking for a caring and kind nanny who will work with their family for the next 8 months – 1 year. This laid back and inviting family is seeking a Part Time Nanny to join their family to help care for their happy and content baby boy. Mom and Dad both generally work in the home so you must be comfortable with work at home parents. The family recently moved here from NY and are currently living in a small apartment on the second floor, so a nanny who is easy going, adaptable and confident is needed They are very flexible with the hours and will work with a nanny who is the right fit for their family. The schedule for this position can be: 20 to 25 hours per week. The family is very flexible for the right nanny! If you are interested and have an ideal schedule please reach out and let us know your preference. This position is offering $22 per hour with with guaranteed hours, they are also negotiable for the right nanny on paid vacation, paid holidays and paid sick days. This sweet and laid back family is looking for a nanny who will be loving, attentive, hands-on, creative, calm, patient, and confident in her role. The ideal nanny for this family is someone who is experienced with and LOVES babies, is passionate about children and her career in the childcare field, nurturing, proactive, and is adaptable. The perfect nanny for them will be someone who loves their career as a nanny and genuinely enjoys spending time with their little one. This family does have two indoor cats, so a nanny who is ok with being around cats is necessary for this position. Child related duties will include overall care of baby including but not limited to: feeding (sometimes bringing baby to mom so she can nurse), diapering, facilitating a healthy sleep/nap schedule, helping baby hit each developmental milestone, playing/reading, walks etc. They live right across from Kierland Commons and Scottsdale Quarter. Household responsibilities will include cleaning up after self and baby, washing all bottles, maintaining the nursery and ensuring baby items are stocked and organized. Load/unload dishwasher. Solely baby related tasks. This is a wonderful opportunity for a nanny who is seeking a position with a loving and happy family! They are looking for a nanny who will really enjoy spending time with their son. Someone who is relaxed, easy going and enjoys playing with their little one. They would also like someone who will engage with their infant in age appropriate activities. They want their nanny to feel valued and appreciated. Their son is a good baby and generally happy during the day. This is a really nice family looking for the same in a caregiver. They are very respectful and enjoy open communication.